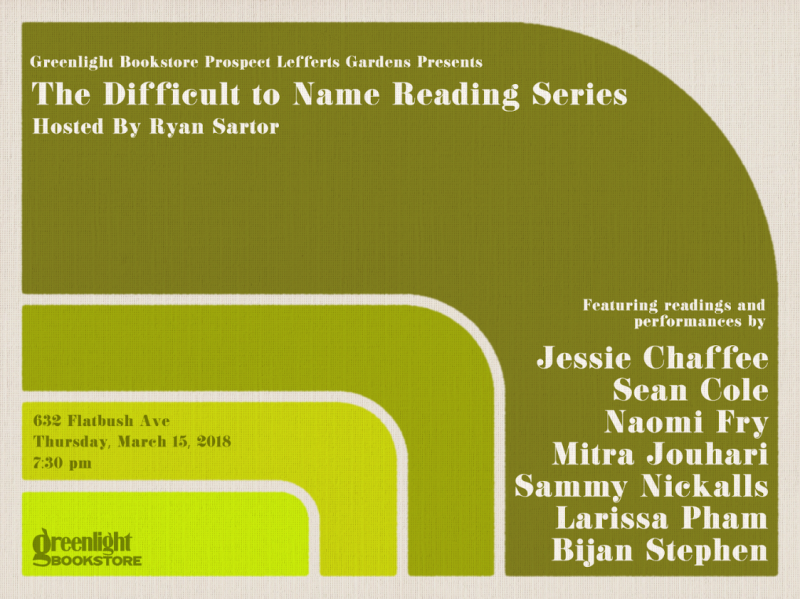 Greenlight is thrilled to host The Difficult to Name Reading Series, the NYC-based reading and performance series founded and hosted by Ryan Sartor. Over 150 writers – including Jami Attenberg, Morgan Parker, Saeed Jones, and more — have read at The Difficult to Name Reading Series since 2014. Alex Vadukul, writer for from the New York Times, has called it “the most institutional reading series in New York” and New Yorker staff writer Hua Hsu has said that host Ryan Sartor “puts the ‘lit’ in literary readings.” Tonight’s reading features Jessie Chaffee, author of Florence in Ecstasy; Sean Cole, producer at This American Life; Naomi Fry, writer, critic, and copy chief for T: The New York Times Style Magazine; Mitra Jouhari, comedian and host of It’s A Guy Thing; Sammy Nickalls, editor at Adweek; Larissa Pham, writer and author of Fantasian; and Bijan Stephen, writer and editor at Vox.